If there is any material needed for your research or study that is not owned by Wintec Library, we can usually get it for you from another library. Any staff or enrolled student of Wintec can request an interloan. How long will it take for an Interloan to arrive? Delivery times cannot be guaranteed as they are dependent on a number of factors outside of the Library's control. On average,time from placing the request to delivery is 1-5 days for journal/serial articles and 3-14 days for books. How many interloans can I request? Students can request a maximum of 10 interloans per semester. Postgraduate students can request a maximum of 20 interloans per semester. Staff can request a maximum of 20 interloans per semester. Articles may be requested for research or private study only. Copies cannot be put on Moodle or copied for students. No more than one article from a particular journal, or two if they are on the same subject, may be obtained at any one time. Contact the Library for further information. How do I receive my Interloan? journal/serial articles we can email you the article if we receive them electronically, or can post to you . Staff and students based outside of the Hamilton area, meeting the Distance services criteria, will be sent their interloans directly - just remember to select the Distance option on the request form and fill in your address. 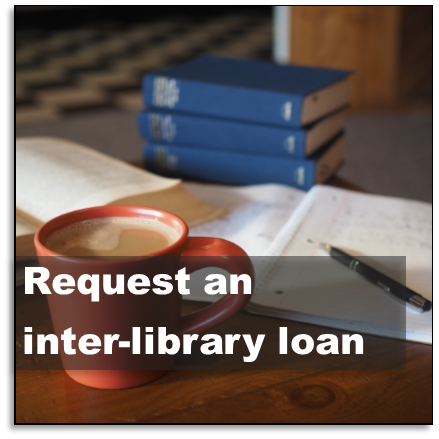 Contact the library if you have any questions about the interloan service.